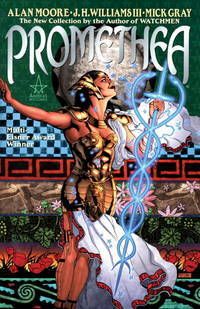 Originally published in single magazine form as Promethea #26-32." 2003-06-03. New. Ships with Tracking Number! INTERNATIONAL WORLDWIDE Shipping available. Buy with confidence, excellent customer service! Alan Moore - Promethea: The Deluxe Edition Book One - Hardback. Book. BRAND NEW. 2019-03-12. Good. Ships with Tracking Number! INTERNATIONAL WORLDWIDE Shipping available. May not contain Access Codes or Supplements. May be ex-library. Shipping & Handling by region. Buy with confidence, excellent customer service! Vertigo. Hardcover. 1401288669 Please allow 4 - 14 business days for Standard shipping, within the US. Thank you for supporting our small, family-owned business! . New. 2019-03-12. Deluxe. Vertigo. Hardcover. 1401288669 Please allow 4 - 14 business days for Standard shipping, within the US. Thank you for supporting our small, family-owned business! . Fine. 2019-03-12. Deluxe. Vertigo. Hardcover. 1401288669 Please allow 4 - 14 business days for Standard shipping, within the US. Thank you for supporting our small, family-owned business! . Fair. 2019-03-12. Deluxe. Vertigo. Hardcover. 1401288669 Special order direct from the distributor . New. WildStorm. PAPERBACK. 1563899574 New Condition. . New. Vertigo. Hardcover. 1401288669 Brand New ,Original Book , Direct from Source , Express 5-8 Business days worldwide Delivery. . New. WildStorm. Paperback. 1563899574 Please allow 4 - 14 business days for Standard shipping, within the US. Thank you for supporting our small, family-owned business! . New. 2003-02-01. WildStorm. Paperback. 1563899574 Please allow 4 - 14 business days for Standard shipping, within the US. Thank you for supporting our small, family-owned business! . Fine. 2003-02-01. 2003-06-03. Good. Ships with Tracking Number! INTERNATIONAL WORLDWIDE Shipping available. May not contain Access Codes or Supplements. May be ex-library. Shipping & Handling by region. Buy with confidence, excellent customer service! Vertigo. Hardcover. 1401288669 . New. Vertigo. Hardcover. 1401288669 Remainder mark . Fine. Vertigo. Hardcover. 1401288669 *LIKE NEW* Ships Same Day or Next! . Fine. Vertigo. Hardcover. 1401288669 *BRAND NEW* Ships Same Day or Next! . New. RHUS, 2003-08-01. Paperback. new. black & white illustrations. The third thrilling collection of the critically acclaimed, award-winning PROMETHEA is back, offered as a softcover version of the original hardcover! PROMETHEA BOOK THREE is a 224-page trade paperback from AMERICA'S BEST COMICS reprinting PROMETHEA #13-18, written by Alan Moore with art and cover by J.H. Williams III & Mick Gray. Featuring the first half of a cosmic road trip, this volume finds Promethea and Barbara traveling an unlikely path. Their wanderings take them through the many realms of Heaven and Hell, visiting manifestations of great visions and visionaries. Meanwhile, back on Earth, Stacia is the acting Promethea - protecting and serving the people of New York while Promethea is away. Is she up to the task? WildStorm. Paperback. 1563899574 Please allow 4 - 14 business days for Standard shipping, within the US. Thank you for supporting our small, family-owned business! . Fair. 2003-02-01. Vertigo. Hardcover. 1401288669 Item in very good condition! Textbooks may not include supplemental items i.e. CDs, access codes etc... . Very Good. WildStorm. PAPERBACK. 1563899574 Like New Condition. . Fine. WildStorm. PAPERBACK. 1563899574 Brand New ,Original Book , Direct from Source , Express 5-8 Business days worldwide Delivery. . New. Wildstorm, April 2005. Trade Paperback Trade Paperback. New. We carry new and used books in our storefront. We want you to be satisfied with your purchase. Please contact us if you have questions regarding this item. America's Best Comics, 2001. Book. As New. Soft cover. In-4, broché, Comme Neuf. WildStorm. PAPERBACK. 1563899574 . New. Wildstorm, April 2005. Paper Back . 4 PB Extra Nice +5%. WildStorm. PAPERBACK. 1563899574 Remainder mark . Fine. WildStorm. PAPERBACK. 1563899574 *BRAND NEW* Ships Same Day or Next! . New. WildStorm. PAPERBACK. 1563899574 *LIKE NEW* Ships Same Day or Next! . Fine. WildStorm. PAPERBACK. 1563899574 Brand New From The Publisher! Not Marked Up Remainders or Shelf Worn Overstocks! . New. Wildstorm. Used - Good. Former Library book. Shows some signs of wear, and may have some markings on the inside. WildStorm, 2001. Book. Illus. by J. H. Williams III. Very Good. Soft cover. 4to - over 9¾ - 12" tall. Sixth printing, stated. Covers clean and bright with light shelf wear. Spine clean and full, no creases. Binding firm. Previous owner's name penciled on front end paper. Otherwise, unmarked..